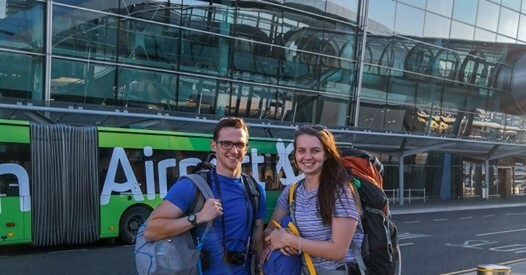 Hey everyone, we’re Lauren and Cathal from South Armagh in Northern Ireland and we’re absolutely, 100% confirmed travel addicts. Not a bad addiction we know! We took our first Interrail trip back in 2015, travelling through Amsterdam, Berlin, Prague, Ljubljana, Zagreb and Zadar and we haven’t stopped since, even going again in summer 2016 travelling through another 8 countries. Sooo, including that first Interrail trip we have managed to visit 34 countries (we did mention we had that travel bug right? ) in just 4 years. We’ve had two Interrail trips (both booked through Interrailing Packages), plenty of mini city breaks to the cheapest places we could fly to, and we’re just recently back from backpacking around South-East Asia. Our favourite spots so far have been Lake Bled in Slovenia , and Berlin in Germany . Bled was simply postcard perfect, like something out of a fairytale! As for Berlin, we’ve been there three times and still haven’t covered everything we want to do yet! Interrailing has always been a great experience for us – Europe is such a diverse continent and to have access to so many European countries with one Interrail pass is something we are so lucky to have access to! One thing is for sure, when it comes to grabbing our backpacks and hitting the road – we’re always ready for that next adventure (although sadly we do have to have real life jobs too, to pay for it all, but hey, we’re only human!). We’ll be packing our camera gear (Lumix Camera, DJI Drone & GoPro) as well as the usual too many clothes (and wearing four coats because of the new Ryanair policy ). And of course, with Interrailing Packages having organised our entire trip including our Interrail pass as well as all reservations and accommodation, we’ll also have our trusty Interrailing Packages’ app, with all our travel documents and itinerary safely stored and ready to access at just the touch of a button. And if you have any travel tips, tricks or recommendations for our Interrail trip then just drop us a comment below our posts.